In honor of Breast Cancer Awareness Month, I’d like to share a little something about a simple way that you can help decrease your risk of developing breast cancer: change your deodorant. There are two very common ingredients in deodorant that continue to be implicated as one of the possible causes of breast cancer – Aluminum & Parabens. 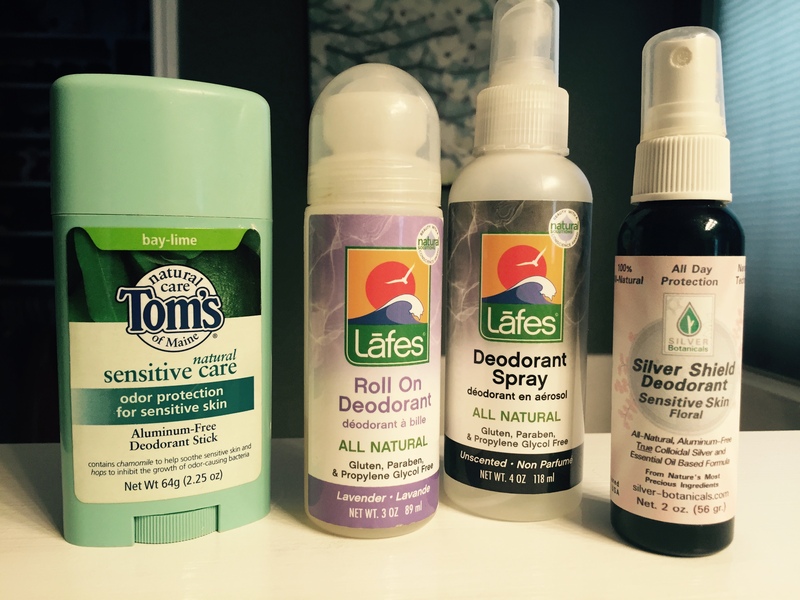 Aluminum is used as an antiperspirant; it blocks pores and therefore prevents sweat. Parabens (look for: methylparaben, propylparaben, butylparaben or benzylparaben) are found in most beauty products and are used to prevent bacteria growth, which helps both the shelf life of a product and preventing odors from developing as you use the product. The issue with both of these compounds is that they are proven to mimic estrogen in the body and cause hormone disruption. Estrogen promotes the growth of breast tissue, but when disrupted, it can lead to an abnormal & excessive growth of cancerous breast tissue. I found this awesome company at my local farmer’s market one Saturday and I am thrilled to be sharing them with y’all. They use a blend of essential oils and colloidal silver. Essential oils have a long list of medicinal benefits and are naturally deodorizing, anti-bacterial and have a long-lasting aroma. Colloidal silver also has many healing properties as an anti-microbial preventing the growth of bacteria. I take it every day as an immune supplement and double up when I’m sick, so it only makes sense to put it under my arms also. I have found this to be the best natural deodorant out there; it keeps me smelling good all day and the more I use it, the less I sweat – it’s getting my body back in balance. One caution: it will sting a lot if you try to apply right after shaving… wait an hour or so. Coming in at only $7.50 for a 2 oz spray bottle (it’s lasted me two months) with the option to buy discounted refills in the future, it’s a great deal. Silver Botanicals also has a great line of other hygiene & household products, my favorite being the Oral Disinfectant mouthwash. If you don’t live in Austin, you can buy online. This was recommended to me by my friends Emily & Ben – they both said that it keeps them smelling fresh the longest of any option they’ve tried. Their list of ingredients contains several essential oils, coconut oil (which I love! ), and does not contain harsh chemicals. I am excited to try it soon and see if it works for my hubby! Buy the handmade 3 oz stick online for only $8.95 and read more about the cool company living out their American Dream. I wrote about this product in my first installment of Health Hygiene Routines and continue to have great success with it. I love that the list of ingredients is simple: mineral salts, essential oils and aloe vera. I still use this regularly because it’s the most effective at preventing sweat. How? Because of it’s use of natural mineral salts. These mineral salts are potassium alum, which I recently learned are technically aluminum, but with molecules too large to fit through your skin’s pores. Essentially, it creates an outer layer that helps block perspiration instead of actually going in your pores like aluminum. While there are not studies yet on if on if our bodies absorb any of the toxic metal from these crystal salts, if perspiration is a problem for you (or you are looking for an option for Summer or exercise), I think it’s worth giving it a go; it still doesn’t contain parabens or other harmful chemicals. I use both the unscented spray and the roll on lavender version. You can find a 4 oz bottle for only $4.50 at Natural Grocers or online. One last option, especially for those of you with easily irritated skin or bad razor burn. I find that the more often I switch on and off of different deodorants, they seem to stay more effective (shampoo is the same way for me… anyone else?). This deodorant has such a cooling effect that it is my go-to after I shave. It doesn’t last very long for me, so I have to reapply once more a day, but I love the smell and it feels so smooth. Again, this option is paraben & aluminum free and the list of ingredients is simple. It uses chamomile to soothe and hops to prevent odor-causing bacteria. You should be able to find the 2.25 oz gel stick at your regular grocery store for $5.00 – I’ve seen it at Whole Foods and H-E-B. For those of you with sensitive skin (like my friend Emily who gets blisters when she uses regular deodorant), you should see the irritation you experience drastically decrease with options that don’t contain lots of chemicals. Wives who do their husband’s laundry, rejoice: You’ll no longer have to deal with trying to bleach those gross yellow stains on all of their white shirts! You’ll be supporting small businesses & companies who truly care about the health of their customers. Is this a change you would make? Which one are you interested to try? Next (Char)coal in your stocking?